Whilst it’s hard to decide what is appropriate to talk about when discussing the killing fields, we take guidance on how we write about the Khmer Rouge regime from the Cambodians themselves. They are transparent, they provide a non-sanitised account of their recent history, and are active even in broadcasting all that happened in the hope that it will never happen again anywhere in the world. 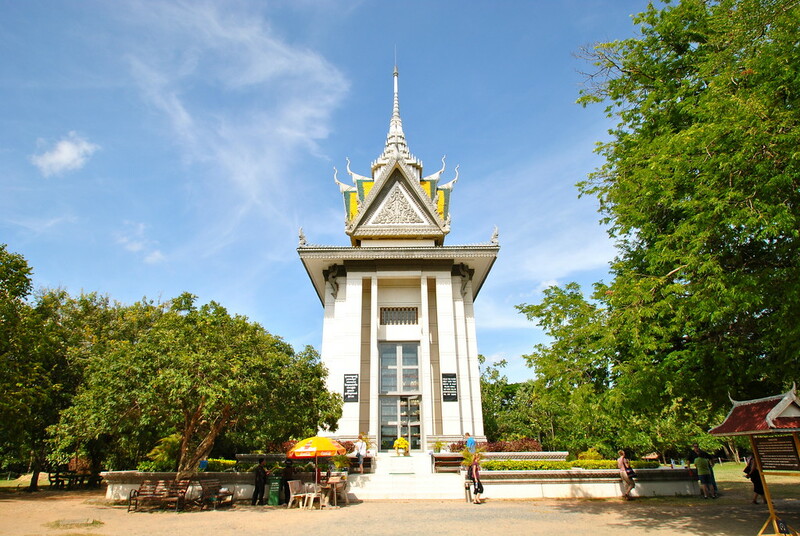 It is with this guidance that we write about our experience of the killing fields. 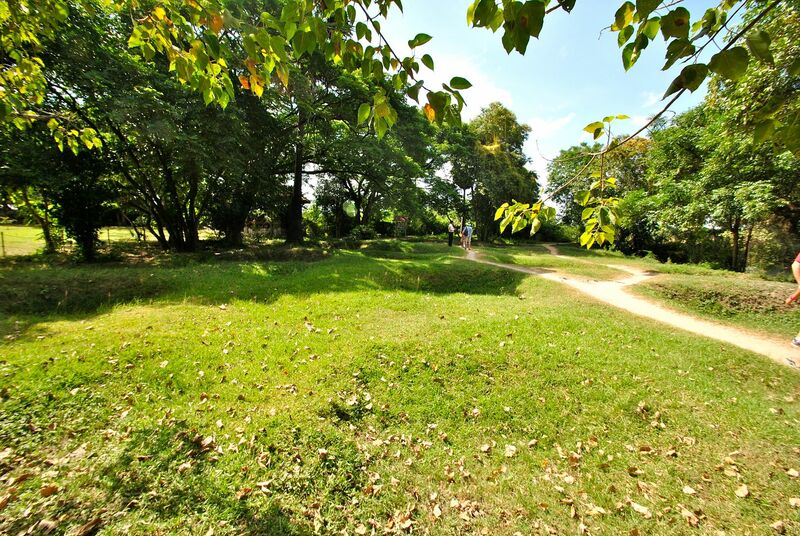 17,000 people are estimated to have been murdered at the Choeung Ek killing field, many of which came from the S-21 prison in nearby Phnom Penh. After a morning at the S-21 prison, it was time to see where many of those prisoners found their final resting place. On arrival at the fields, we were given a set of headphones and audio commentary to listen to as we walked around the site. Straight away we were drawn to the memorial tower, built to remember all of those who died here. Its glass facades towering over the green fields of the area, we were to return to this at the end of the tour. The killing fields still feel very raw in situ. As we walked around the site, we were gently reminded not to pick up or disturb any bone fragments or clothing that may be laying on the path. As the killings are still recent history, when it rains on the site, pieces of bone and clothing come to the surface, and are delicately collected by the site supervisors. We couldn’t quite comprehend this as we started walking round, but quickly became accustomed to watching where we walked out of respect. Walking from one ditch in the ground to another, we were told the story of what occurred here. Prisoners from S-21 were driven here during the night, made to stand in the back of covered trucks for the 17 km journey to the fields. To keep the prisoners calm, they were told they were being moved to another institution as S-21 was full. On arrival, they were placed in a wooden shed, manacled to the floor. As electricity was unreliable, the site was powered by large, and noisy, generators which masked the screams of people who were being murdered in the fields adjacent to the holding huts. When it was their turn, inmates were led out in small groups, made to kneel by the side of a ditch and were hit by a machete or hammer. The Khmer Rouge didn’t want to use up precious bullets. Our stomachs wretched at this, as we walked passed ditch after ditch after ditch. For a while we sat on a bench to compose ourselves. After S-21, this was hard to stomach, but there was much worse. We were about to learn about the Killing Tree. 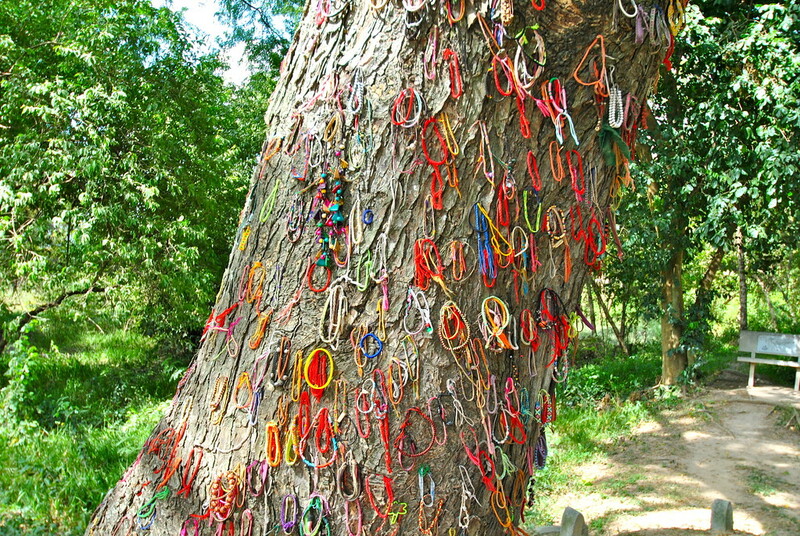 As we approached it, we were intrigued by all the colourful bracelets hanging off the tree. What was this all about? We hit play on our handsets, and learnt the awful truth. The shortest possible way to explain it is to say it was used to kill babies and small children, with graphic details of the methods used. You can google for more details should you wish, but this was the part of the killing fields that hit us the hardest. Why kill the babies and small children? The Khmer Rouge did not want anyone seeking revenge for what they had done, so decided to wipe out the children of families as well. The bracelets had been left as some sort of memorial, a small recognition of what had occurred here. We left and made our way back to the memorial tower we had been so drawn to as we arrived. Towering over the site, with glass panes all around the perimeter, the tower was created as a simple monument to all of those lost. As we moved inside the tower, we already knew what to expect on entering, but again we were left speechless. When the site had been discovered following the collapse of the Khmer Rouge, the liberators went about documenting all the graves and victims in the fields. Their remains were left stored for a number of years before the memorial was built, and it was decided that much of the remains of those who died here should be put on display as a reminder of all who was lost. 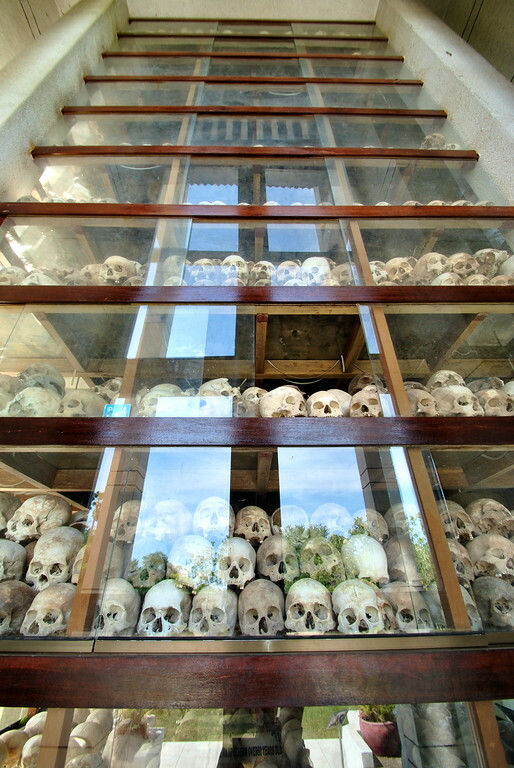 The first few shelves contain 5000 skulls of those who perished, stacked on top of each other. Looking closely, you can see how many of those people perished by the damage to their skulls. The following shelves containing other remains. It’s a startling exhibit, and we didn’t know what to make of it. Wasn’t it all a bit grotesque? What about giving them a proper burial? As we said at the start of the article, the Cambodians do not sanitise what happened here, and this is a classic example. The killing fields are an awful place to visit, but again an unavoidable reminder of the recent history of Cambodia. The site itself is large, and took us 3 hours to get around by foot, as we listened to every piece of audio commentary on offer. Following a morning at Tuol Sleng S-21 prison, and an afternoon at the killing fields, we were ready for home. Our tuk tuk driver Paulie took us back to our guesthouse, this time without a comment on what had occurred here. Thanks for the comment Kenny, it was a harrowing day indeed. Oh my goodness – how absolutely awful!!! We really do forget how some people have to live in other parts of the world as we complain etc. about our lives here in Britain!!! I would imagine it will take you both a long time to cope with the memories and stories which you have just described…..